The most important ranking factor for websites is links. Unfortunately, link building is quite challenging. At the same time, it’s also the easiest way to get into trouble with the search engines. Fortunately, there are some techniques that won’t get you into trouble, but instead will help you with your law firm SEO. Actively share links to your website on Facebook, Twitter, Google Plus, Instagram, and LinkedIn. While this won’t give you any “link juice,” it will get you exposure and traffic. 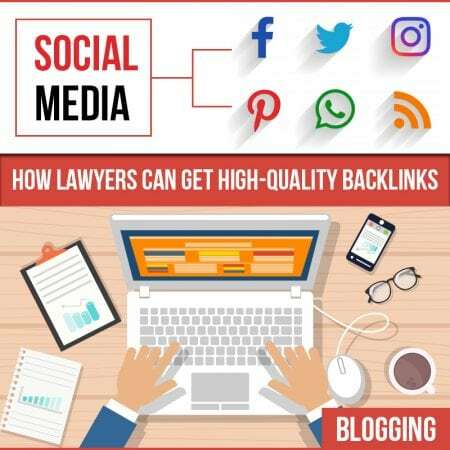 Your posts may also get shared and even become viral, which will get you natural inbound links and the “link juice” you need for good law firm SEO. This is why you should try to get your most shareable content out there on these channels for others to share. Always do your best to make sure this content is highly relevant, useful, and contains a link leading back to your website. This is a fun, interesting way to share information. People enjoy sharing them, especially if they’re well done. As such, a good lawyer SEO tactic is to always place an embed code at the bottom of it for people to use on their own websites. When they do so you’ll get a backlink to your site. When submitting to any of these directories make sure they’re reputable and have a high page rank. It’s also good to see your colleagues and competition listed there. Collaborating with colleagues, other businesses, and your clients can also offer you high-quality links. You can do this via guest posting, joint marketing efforts, or honorable mentions (a.k.a. citations). A lot of these probably won’t give you “link juice” but people may follow them to your site. As a lawyer, your schedule is already fully booked without worrying about your lawyer SEO, but you know how important it is. We at the Local SEO Tampa Company understand that you only have 24 hours in your day and we’re here to help. Law firm SEO is one of our specialties that we’ve successfully helped many clients with in the past. We look forward to helping you as well, so make sure you reach out to us today so we can start bringing new clients your way soon.